Homemade Toy Story Group Costume – To Costume Infinity and Beyond! Great minds think alike. 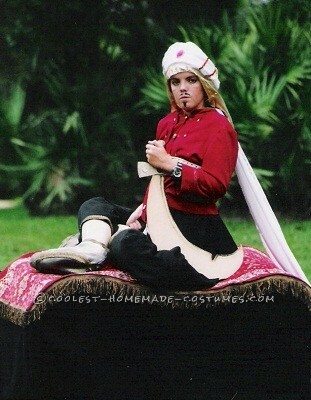 In the 10 years since I made this Magic Carpet Ride Costume, I have seen about one or two others who make this costume every year. I created this costume for a Broadway producer who was working on an off -Broadway production. He was in the area visiting his mother and he was referred to me when he heard I liked making costumes. The production was called 1001 Nights and was based on the story of Shaharizard from Aladdin. The show never made it to the big time, but it was a bit of a sensation here locally. I didn’t get compensation for my work, just the memories of working with an actual Broadway producer/director! To begin with I was given an old carpet runner and asked to come up with a “flying” magic carpet. I made a wooden frame that I glued a piece of the carpet onto and attatched thrift store belts to be worn like suspenders to hold the carpet and frame up. Then I added trim around the edges and black fabric to hang underneath to hide the wearers legs. There are simple muslin faux legs that sit atop the carpet. I added pointy toed slippers that I made to the faux feet. There is baggy black pants that go over the faux legs that the wearer steps through. The jacket was made from a commercial jacket pattern. I fashioned a turban from white fabric and a scimtar from thin wood that I cut out on a scroll saw and painted with acrylic paint. The director , Andrew Kato, was thrilled with the results and was very appreciative. He is now in charge of a local theater in Jupiter , Florida, but returns to NYC to work on the Tony Awards every year. Homemade costume idea posted by Darcy R.